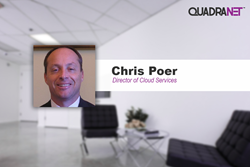 QuadraNet, Inc. is pleased to announce the new hire of Chris Poer, who will join the QuadraNet team as the company’s Director of Cloud Services. Within this role, he is responsible for expanding product portfolio in Cloud Services as well as building out a network of partners to grow the business. Mr. Poer joins the company with an excellent reputation with over 30 years of experience in the telecommunications and information technology industries having worked as a product management, business development, and sales in highly renowned companies like AT&T, Bell Labs, Lucent Tech, and Openwave Systems. His most recent exposure includes his role as the Vice President of Sales & Marketing at ENKI Corporation, a premier provider of nationwide cloud services.